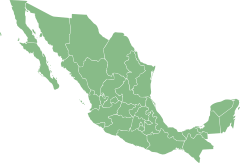 Mexico is divided in 31 states and one federal district, these are divided into more than 2400 municipalities which host about 180.000 localities ! Here on nuestro-mexico.com we provide the traveler as well as the interested reader with statistical detail for very most of these villages and cities. The data is based on the last people count hold in the year 2005. The locations show up with maps by google and pictures provided by panoramio.com .